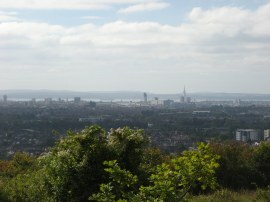 I did this walk on Sunday 26th September 2010. 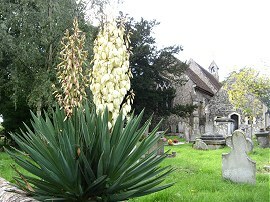 I had spent the night at Anne's house in New Arlesford and in the morning we drove down to Emsworth before taking one of the cars up to Hambledon to resume our walk along the Wayfarers Walk, some six months after we had finished the previous stage. Setting off from St Peter & St Paul church, photo 1, we headed down Church Lane to cross over West Street before continuing ahead uphill along Speltham Hill. 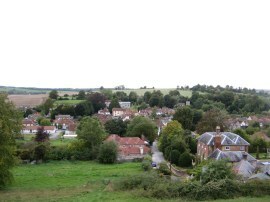 Where the road bends to the left we then joined a footpath that continued ahead, climbing very steeply across a short section of field from where we could look back over the village in the valley below, photo 2. 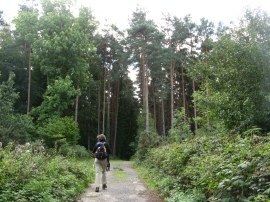 The path passes through some trees and heads into a field as the gradient gradually diminishes. Leaving this field the route crosses another field to reach a minor road nr Rushmere. The path heads over this road along a path running between gardens in one of which was a huge metal vice sitting on top of a tree trunk which was one of the more unexpected things I have spotted while out walking. Turning to the left the Wayfarers Walk then follows a field edge path alongside a couple of fields before heading to the left again to reach Rushmere Lane. Here the route heads to the right for a short distance before heading along another field edge footpath on the left, photo 3. The day had started quite cloudy but looking ahead we could see brighter weather on the horizon which gradually made its way over to us. Just after the hedge bends slightly to the left the route heads to the right, running diagonally to the left across a field, passing under some power lines, to reach Harrowgate Lane. Once again the route heads to the right along the road for a short distance up to a T junction. Here the route heads briefly left before joining a footpath on the right. 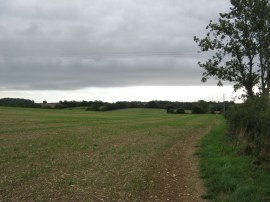 This is followed alongside the edge of a number of fields towards the village of Denmead. Heading to the left this road soon reaches a junction where the Wayfarers Walk heads left down Newlands Lane. 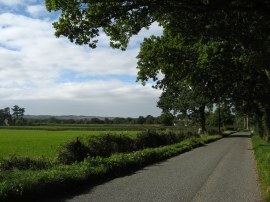 Where this road bends to the left the route heads to the right through the farmyard of Closewood Piggeries, photo 7. 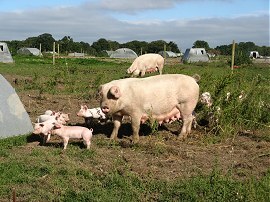 There were a large number of pigs and piglets in little enclosures besides the path and we spent a fair bit of time trying to get the perfect piggy photos as we went by. There was a little bit of a breeze and having slowed down to take the photos it soon felt cool enough for me to put my fleece back on again. Leaving the piggeries the path heads along the edge of another field before crossing a wooden bridge over a small stream and heading up to Sheepwash Lane. 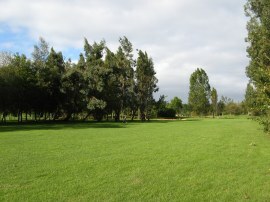 Continuing across the road the route joins a broad grassy track which is followed round to the left before crossing diagonally to the right over a paddock surrounded on three sides by trees. Reaching the next field the route follows the right hand field edge to enter into a patch of woodland. 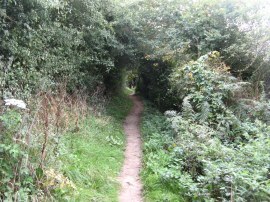 The path then heads through the trees along a broad track, photo 8, for almost half a mile up to Purbrook Heath Road. Reaching a gap in the trees that line the road we were able to see over to the Ports Down chalk ridge which we would soon be walking over. 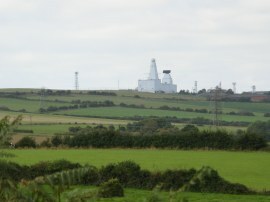 Along the top of the ridge we could see the low profile of Fort Widley, which is one of a chain of five forts that occupy the top of the ridge between Fareham and Havant, along with another much larger structure rising above the skyline, photo 9, which I have yet to identify. Shortly after the junction with Newlands Lane the route leaves Purbrook Heath Road, joining a track that heads downhill to the right with playing fields on the left. On the map the Wayfarers Walk is shown as heading across a small patch of woodland to reach this track however we could find no evidence of a path through the trees so followed the road until the start of the track. Shortly after passing an attractive tudor cottage the route joins a hedge lined footpath, photo 10, that runs between fields. After crossing a small stream the path heads steadily uphill, bending to the left to run along the back f some houses before eventually reaching the rather busy B2177 Portsdown Hill road, close to two tall radio masts. Here the Wayfarers Walk heads to the left along the road but we detoured to the right for a short distance to get our first proper views of the coast. Despite the rather hazy weather these were quite spectacular with Portsea Island and Portsmouth ahead, photo 11, with the Isle of Wight in the background. 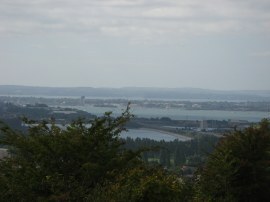 To the west was the watery expanse of Portsmouth Harbour, photo 12, and to the east, Langstone Harbour and Hayling Island, photo 13. The path alongside the road heads gently downhill to cross over the M3 at the outskirts of Bedhampton. 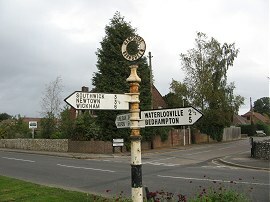 Eventually, at the junction with the B2149 and the B2150 the route leaves the road and joins a footpath on the right that runs between houses and alongside a recreation ground, where a womans football match was starting. 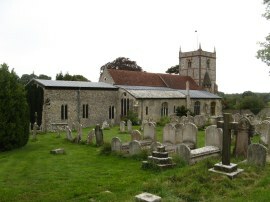 The path then heads over a car park, passing by the St Thomas Church, photo 16, before crossing over Bidbury Lane and continuing ahead up Mill Lane which carries the route over some railway lines. The route then joins a footpath on the right that curves round to pass back under the road bridge, the footpath now running alongside the tracks. Reaching a driveway the route heads to the right towards a small waterworks before joining a fairly enclosed footpath that bends round to the left before the Wayfarers Walk heads to the right across a bridge over a rather dingy flood relief channel. 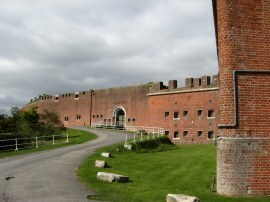 The route then continues ahead, crossing over a field to reach an industrial estate. Here the path continues ahead along the edge car park before joining a footpath that runs to the left round the back of the industrial estate, parallel with the A27. This rather dingy section of the walk is followed as the path bends round behind the estate before heading up some steps to join the Brockhampton Road. 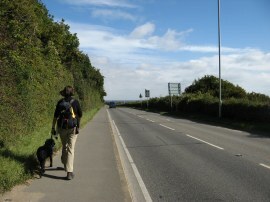 Here the route heads to the right, crossing the road bridge over the A27 dual carriageway. A short distance further on the route heads to the right along Harts Farm Way before joining a footpath on the left which marks the spot where the Wayfarers Walk links up with the route of the Solent Way. 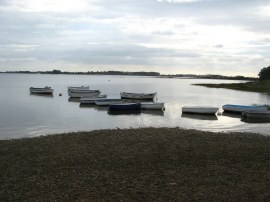 The paths then share their route all the way to Emsworth which is the start / finish point of both trails. 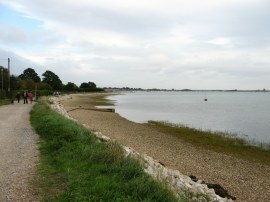 The footpath crosses over a small stream which soon becomes broader as the path heads past a gravel works to reach the coast at Langstone Harbour, photo 17. Although this was not the end of the walk I did feel a certain sense of achievement in having reached the coast after having set off from the Hampshire Hills. 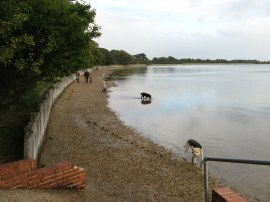 The route then follows the water edge round the harbour, photo 18, at one point crossing over a narrow shingle beach, before heading up alongside a small creek. Crossing a small bridge over the creek the route heads along Mill Lane in Langstone. Where the lane bends to the left the route continues ahead on a short footpath that runs up to the A3023 where there was one final Wayfarers Walk distance marker, photo 20, which showed we had now walked 67.5 miles along the path and had just 2.5 left to do. Heading over the A3023 the route heads down the picturesque Langstone High Street to rejoin the waters edge, the path now running alongside the waters of Chichester Harbour. 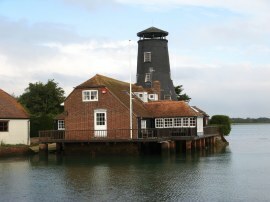 The path heads past a number of cottages and a pub, right at the waters edge, before bending round to pass Langstone Mill and its mill pond, photo 21. 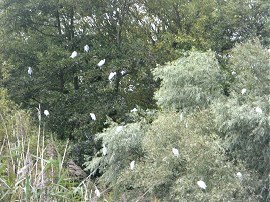 Roosting in the trees at the back of the mill pond were a large number of white egrets, along with a few herons, which was a very unusual sight and reminded me of all the times I spent trying to get a decent photo of a white egret and here were loads, right in front of me. A short distance further on the route crosses over a beach backed by wooden railings, photo 23, which would have been underwater at high tide however this had just past and we were able to make our way across to rejoin the slightly raised path on the other side. 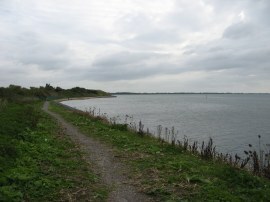 The route then continues alongside the edge of Chichester Harbour before taking a footpath on the left which heads diagonally over a field towards a church at Warblington. 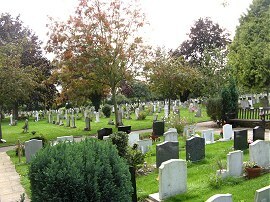 The route winds through a large cemetery, photo 24, then heads down a track that runs alongside the church before heading out along a field a field edge path from where there were views over to the remains of Warblington Castle rising above the trees. Leaving the field the route joins a track running along the edge of Nore Barn Wood to reach the outskirts of Emsworth where the Wayfarers Walk once again joins a path running along the edge of the shore of Chichester Harbour, photo 25. 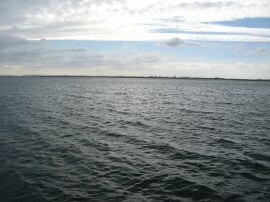 The path, photo 26, is followed past houses and by a small sailing club before continuing along a breakwater that curves round to the left with sea on one side and the waters of a large mill pond on the other, photo 27. 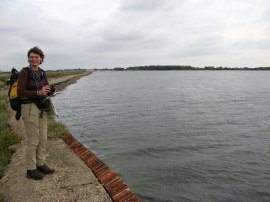 We had been lucky to be passing through the area at high tide which meant that the harbour was full of water which was probably more picturesque than the mudflats that would have been exposed at a lower tide. Reaching the end of the breakwater we stopped for a quick drink at a small cafe. 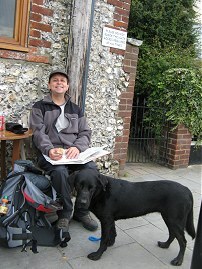 We were unsure exactly where the Wayfarers Walk ends in Emsworth and we made this the official end point of the route, photo 28. 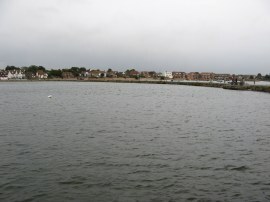 After our refreshments we then headed over the beachfront at Emsworth before heading up some steps on the left up to Tower Street which we then followed to Queen Street. From there it was just a short walk to the right along the road to our parking spot. Reaching the car we had walked 16.1 miles of which about 15.7 had been along the Wayfarers Walk itself. So, another recreational trail completed. All in all the Wayfarers Walk has been a very enjoyable walk from the high Hampshire chalk hills across the county to the coast. It had been nice to be walking in a part of the countryside I had not been to before and there were very few dull parts of the path. 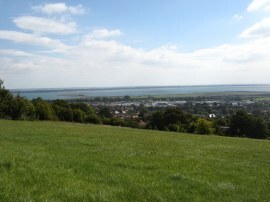 Despite the long walk alongside the B2177 I had particularly enjoyed the final stage, particularly the coastal stretch from Brockhampton to Emsworth with the views over Langstone and Chichester Harbours. Other pleasant memories are of the chalk streams near Arlesford and setting off from Gibbet Hill on the cold frosty December morning. 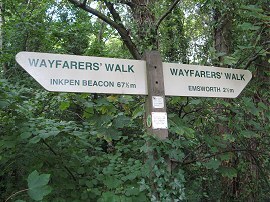 I have uploaded the route of the walk which can be accessed here: Wayfarers Walk stage 5 Route.